A slightly more than half-length image of Jesus wearing a red tunic and blue robes. Holding the cross with both hands, he rests it on his left shoulder. His head is slightly raised and his watery eyes bear a serene, resigned expression as he looks to the heavens. The crown of thorns on his head is reinforced by a luminous rhomboidal halo. The precisely rendered crown shows each of the tender, interwoven branches bearing small shoots. It is perfectly set on Jesus’s forehead and a few drops of blood have fallen onto his neck from the small cuts caused by its thorns. There is no sign of pain on his face, however, and he shows neither anguish nor the effort of carrying the cross, which he seems to embrace like a light instrument on which to rest his large, delicate hands. 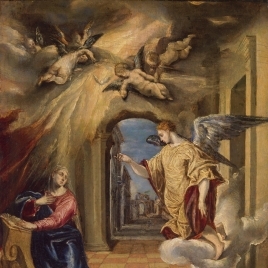 The image is reinforced by its presentation of Christ’s figure in a sotto in su perspective, that is, looking upwards from a very low viewpoint. 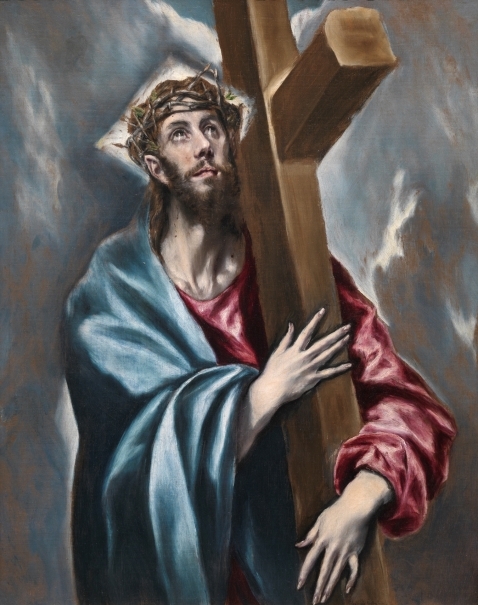 The background is a stormy sky of the sort quiet characteristic of El Greco’s works, with no narrative references to distract the viewer’s complete focus on the figure of Christ and his relation to the cross. 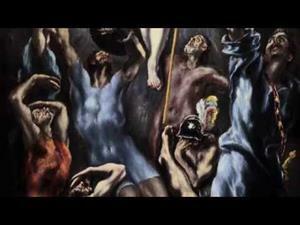 This composition is an autographic variant of one of El Greco’s subjects. And while the subject was not completely original, it was widely accepted in his time. 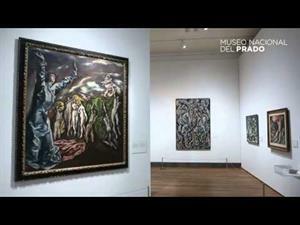 Some authors have praised El Greco’s brilliant ability to transform a traditionally narrative representation into a votive image, and this is explained by the Counter-Reformist mentality of Spanish spirituality. The model for Christ’s physique here coincides with that of the Disrobing of Christ that El Greco painted for Toledo Cathedral in 1578. Images of Christ carrying the cross on his way to Calvary were relatively frequent in Christian iconography, and examples from as far back as Paleo-Christian art are linked to texts referring to the cross’s symbolic role as an instrument of salvation and the attainment of eternal life. 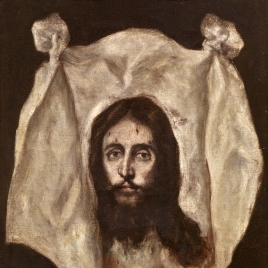 El Greco transformed the stark views of Christ in pain and weighed down by exhaustion and physical punishment on the Via Dolorosa, which had had important repercussions in the second half of the 16th century, both in Italy (Sebastiano del Piombo, Corregio and Titian) and in Spain, where small devotional panels by Luis de Morales (ca. 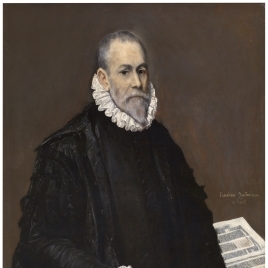 1515-1586) were highly accepted between the 1560s and the 1580s. Morales imbued the cross with an undeniably allegorical character that was linked to the Medieval meditations attributed to Pseudo-Buenaventura (Meditationes vitae Christi). 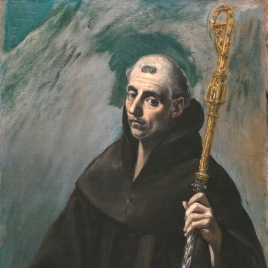 The devotional character of his works carries over into El Greco’s compositions, but the latter replace Morales’s dark, neutral backgrounds with spectacular skies. 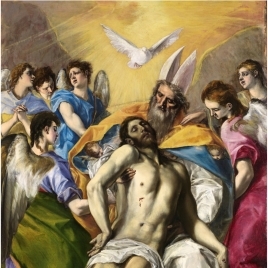 Moreover, El Greco pushes the figure’s sotto in su perspective to such a point that the conception is practically sculptural, and possibly related to images from the Holy Week processions that were so important in Spanish religion at that time. 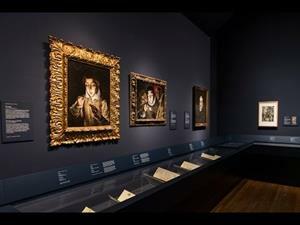 Those images, however, retained a sense of pain as a means of stimulating believers’ compassion and empathy. 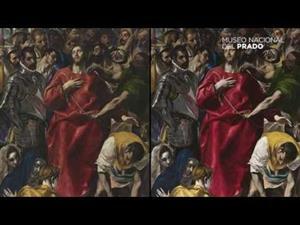 This version from the Museo del Prado is of great quality, brilliantly executed and very successful in its colors and lighting. 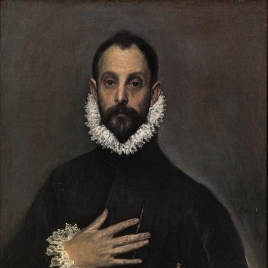 The hands are outstanding, with the mother-of-pearl nails characteristic of El Greco, and they are shaped with great sensitivity. 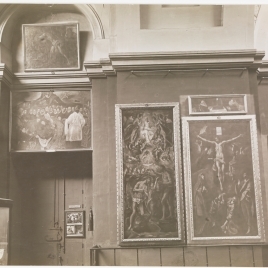 The work must have been painted around 1600-1605, following completion of the altarpiece at the College of doña María de Aragón in Madrid (1596-1600) and the group of works for the Hospital de la Caridad in Illescas, Toledo (1603-1605). This work entered the Museo del Prado in 1872 via the former Museo de la Trinidad, which had gathered works from the convents closed by the disentailment laws promulgated by Juan Álvarez Mendizábal between 1835 and 1837. Height: 108 cm. ; Width: 78 cm.